Something fishy has been going on with Apple’s App Store top charts. No, I’m not talking about “Flappy Bird” (well, maybe that too), but rather how on earth two different developers used a $10 GameSalad template to send their respective apps — one free, and one paid — into the App Store’s top charts. And more importantly, how did that paid app keep climbing the charts, earning a developer who’s clearly a well-known scammer, a lot of money? Industry insiders noticed this was happening earlier this month, though word has spread further as the apps climbed higher and higher in the charts. 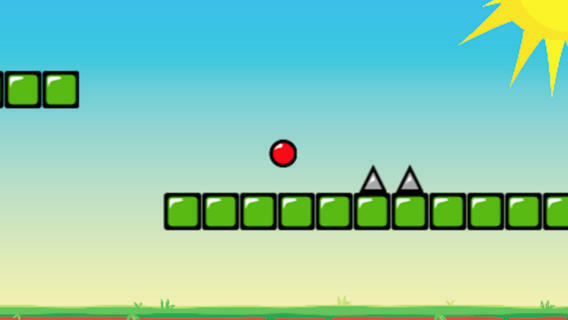 The GameSalad template in question is called “Red Bouncing Ball Spikes.” It’s a simple game that would appeal to those looking to ride the “Flappy Bird” wave by exploring other iOS titles that don’t require a lot of cognitive overload, but are rather designed to let you just start playing. Also, it’s kind of a terrible game. As of February 14, the free version of the game, created by “Talo Games,” had reached the No. 73 spot in the App Store’s free charts. This is the same developer behind a number of titles, including most recently, the hilarious “Flappy Bird” parody, “Flying Cyrus,” involving Miley Cyrus’s head and several wrecking balls. Talo Games’ developer, who was recently interviewed by Israeli blog Geektime, released his free version of the Red Ball game on Feb. 10, 2014, well after the paid version launched in December 2012. Obviously he’s just having some fun by taking advantage of the App Store buzz, not scamming. Meanwhile, the paid version of the game comes from a more controversial developer known as Mateen Pekan (which may not be his real name). His app reached No. 8 on the App Store’s paid charts as of last week. At one point, the template-based title became the #2 paid iPhone app on Apple’s App Store. Now here’s where things get strange. OK, stranger. The paid app, as noted above, was released in December 2012 and only shot up to the top of the App Store after an “update” released on Jan. 30, 2014. As for the paid version of the “Red Bouncing Ball Spikes” game, GameSalad forum members recalled that the developer in question, “Mateen Pekan,” has been dubbed a scammer in the past. He has ripped off developers repeatedly, stolen games and source code, and been banned from forums like GameSalad itself. He is reportedly based out of Canada, young, and goes by several names, including also “Firoozeh Morady,” “Louis Leidenfrost” and maybe more. Some basic Internet research traces Mateen to this Google Play listing as well, which is for Mooney’s Bay Computer, a computer store in Canada. Some guess this is where Mateen works, but it’s more likely he just did a little freelancing for them. He has also pushed his Red Ball game to Google Play, where it remains among other titles. Other game developer forums, including TouchArcade, have also spotted that Red Ball is the work of Mateen, and have been calling the game’s ascension in the App Store a scam. The going theory is that Mateen (or whatever his real name is) utilized a particular App Store scam that requires you to manipulate gross sales figures by, say, using your own money. As one member on the GameSalad forum points out, the Rank History on App Annie shows that when you compare the Red Ball paid app to others in the top 10, it had high gross sales but lower downloads. Generally, apps in the top 10 have both high gross sales and high downloads. To perform this scam, a developer would have to use a network of iTunes accounts to download enough copies of the game to push the game’s gross sales to $20,000. The payday comes as the app sits in the top of the App Store for multiple days on end, earning that money back and then some. What’s perhaps more concerning than the fact that a scammer has figured out how to manipulate the App Store algorithms for ill-gotten gains (it’s bound to happen), is the delayed response from Apple. This title has been climbing the charts all month, but it’s only recently been bumped out of the top 100. And how? Through direct intervention on Apple’s part? Did Apple’s algorithm just now catch this? We may never know. Update: Or maybe we will! We’re now hearing that Apple didn’t take any action to remove the app from the top charts directly, but rather the app fell out of the ranks on its own – maybe as people wised up as to who was behind it? This app is in the top 5 in overall paid apps on the app store making $10,000 a day! On Febuary [sic] 5th and 6th it was the #2 app in overall paid section with very little promotions. 50,000 downloads in less than a week. We are willing to negotiate. Maybe Mateen listed the app because he needed to recoup his investment quickly before he was totally unmasked as a scammer? He slashed the price to $250,000 earlier this month and he tried to sell the Android version, too. Apptopia founder Jonathan Kay tells us that they had him listed as both “Mateen Pekan” and “Firoozeh Moraday.” His company decided to remove his app from their website due to the bad press and discussions regarding his history, as well as from feedback they received on Twitter. Kay adds that they’ve only pulled listings two or three times in Apptopia’s 2.5 years, which indicates how seriously they took the problem. (Unfortunately, they can’t confirm the original listing price, but at the time of takedown, it was $250K). But even though the game developer community and other third parties seem to be well aware of Mateen’s general M.O., and there are plenty of references to him being a known con artist, both Apple and Google have so far allowed him to maintain listings in their respective app stores. This could be because the app hasn’t raised any flags that normally would have an app caught as being a scam, and/or because no other developers have complained using the official channels. Today, Mateen’s app is no longer in the top charts on iTunes, but Appsfire CEO Ouriel Ohayon, who was among the first to spot the templated-game’s rise, reminds us that a top paid app in the U.S. market can make you “tens of thousands” per day in paid downloads. If you were suckered into actually buying this thing, get your money back from Apple. Here’s how.